Christos Karatzios, Costas D. Triantaphyllidis. 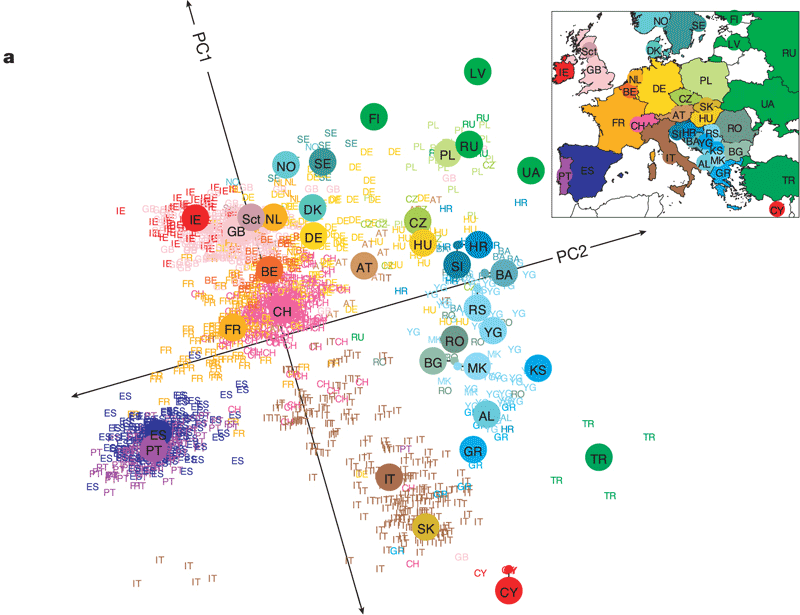 In the "The History and Geography of Human Genes" Cavalli-Sforza, Menozzi and Piazza  grouped Greeks with other European and Mediterranean populations based on 88 to 120 loci (FIG. 22, FIG. 23, FIG. 24). Furthermore in this analysis of Europeans based on 88 genes, Cavalli-Sforza, Menozzi, and Piazza show that Sardinians and the Lapps of Finland form extreme outlier groups among Europeans. Greeks, Basques, and Finns are also outliers among the Europeans. They explain that in this case outliers implies that all the other European populations are related to these peoples which form the borders of the genetic structure in Europe (FIG. 24). They also clearly state that Greeks are some of the earliest contributors of genetic material to the rest of the Europeans as they are one of the oldest populations in Europe . FIG. 22 - From Cavalli-Sforza et al. 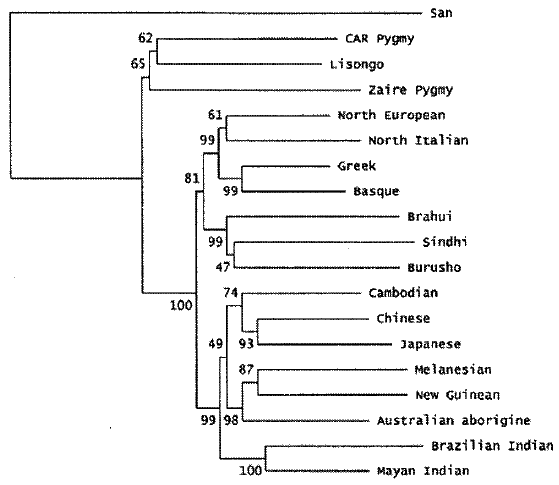 (1994) "The History and Geography of Human Genes" , page 82, Figure 2.3.5. Principal-component map of the 42 populations. Greeks cluster with the Europeans (upper right corner). FIG. 24 - From Cavalli-Sforza et al. "The History and Geography of Human Genes" , page 269, figure 5.5.2. 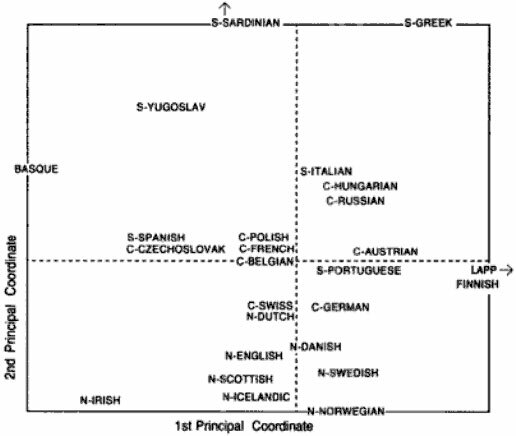 Principal component map of Caucasoids: N, C, and S denote Northern, Central, and Southern Europeans. All European populations are related to Greeks, Basques, and Finns, which form the borders of the genetic structure in Europe. African and non-African populations do not cluster together. Greeks cluster with other North-European and South-European populations (like Italians) and are close to the Basques. Japanese cluster with other Southeast Asian groups (e.g. Chinese, Cambodians), and with Pacific and New World native peoples. San (Bushmen) are some of the earliest peoples in Africa. The origins of humankind can be traced to Sub-Saharan Africa. This is in agreement with a more recent worldwide population study of 938 people from 51 human populations using 650.000 autosomal single-nucleotide polymorphism loci to construct a worldwide population dendrogram . FIG. 25 - From Ayub et al. , figure 2. Neighbor-joining tree, representing relationship between 19 modern human populations. Tree is based on Das genetic distances for 182 tri- and tetranucleotide microsatellite repeats. Bootstrap resampling values are provided at each fork. Greeks cluster with the Europeans. Greeks cluster genetically with 41 other Europeans populations tested. Greeks were quite different genetically from Mexicans, Indians and Pakistanis (subcontinent), and southeast Asians. Greeks cluster closest to other European and Mediterranean peoples. Greeks do not cluster with Sub-Saharan peoples. FIG. 26 - From Novembre et al. , figure 1a. Population structure within Europe. The authors used 1,387 Europeans (for whom they have high confidence of individual origins) and 197,146 autosomal single-nucleotide polymorphisms (SNPs) for the construction of this graph showing their genetic pattern. It resembles very much the geographic map of Europe. Neighboring populations cluster close to each other, while being distinguishable. The Iberian peninsula, the Italian peninsula, southeastern Europe, Cyprus and Turkey can be recognized on the graph. Greeks are closest to Italians, Romanians (small sample size) and Former Yugoslavians , and to Albanians, southern Balkan Slavs, Romanians, Bulgarians, and Italians  (FIG. 26). Vardar Slavs cluster very close to Bulgarians  (FIG. 26). The genes contained on the Y chromosome and in mitochondrial DNA can be used to trace one's origins through genealogical lineages [16,34,39,42]. The combination of genes are classified into groups called haplogroups. The Y chromosome is transmitted from fathers to sons and a patrilineal lineage can be determined using this. The mitochondria are small structures that provide energy to all cells and they contain their own DNA. They are transmitted in a matrilineal manner and therefore matrilineal tracing can be done using their DNA. The Y chromosomal and mitochondrial haplogroups can be used as markers to trace a person's ethnic origins [33,34,39]. FIG. 27 - From King et al. , figure 3. Principal component factor analysis of Middle Eastern and South East European population affinities from the gene pool of Y-chromosome haplogroup frequencies. Greeks cluster with Middle Eastern and South East European populations. (G1-G3 data points indicate three geographic regions in Greece. T1-T9 data points indicate nine geographic regions in Turkey). Egypt, Oman and the Bedouin samples from the Negev tend to form an isolated cluster, distinct from the Greek data. Greeks cluster with other Europeans [33,55,56,57,58]. Y-haplogroup E originated in Africa. Y DNA haplogroups E3b, J2 and G belonged to the early farmers that arrived in Europe from the Middle East, while haplogroup I represents the old farmers. Thus, the I, E3b, G and J haplogroups are some of the oldest Y DNA genes seen in Europe . The R subhaplogroups are attributed to repeated ancient human population migrations into Europe. They are seen throughout Europe. Similar to European peoples, classical sub Saharan Y chromosomal haplogroups are not seen in the Greek population. The African type E haplogroups seen in the Oromo and Amhara peoples of Ethiopia are virtually not existent among Europeans, although some E subhaplogroups are shared by sub Saharans and Europeans . In this regard, and in contrast to Arnaiz-Villena's and Hajjej's conclusions, Greeks and sub Saharan people do not cluster together genetically in modern times [55,58] (FIG. 27). The I haplogroup is spread in all European populations with variable frequencies [60,61], albeit at lower frequencies in southern Europe (including Italians and Greeks). The J haplotype is not common in Slavic peoples being practically non-existant in Croats. However, the J haplogroup - a genetic marker for early farming - is seen in high frequencies in Albanians (28%), Greeks (21,3%) Vardar Slavs (20%), Bulgarians (12%) and Turks (38%) [33,58]. Greeks carry signature haplogroups (G, J) with some regions in Greece showing very high concentrations of such genes (some regions have the highest in the World: for example the J2 type of the J haplogroup in Crete) : The J2 type haplogroup concentrates highest in Southern Greece (almost 45% in Crete to almost 15% in Northern Greece) [33,60]. Other J subhaplogroups also show a south-north gradation in Greece . Greeks (especially in northwest Greece) as well as southern Italians, and Albanians carry the E haplotype at high concentrations (20 - 25%) [58,59,61]. Greek signature E haplogroups have been seen in Southern Italy [58,59]. The frequency of the E haplogroup is lower in Vardar Slavs (15%) than in Greeks (24%) . The frequency of the R1b haplogroup is similar among the Balkan populations (Croatians, Yugoslavs, Vardar Slavs and Greeks), but is considerably lower than in western European populations . The R1a haplogroup type is most commonly seen among eastern European peoples. This type can also be seen in populations in the Middle East (modern Iraq and Iran) . The R1a haplogroup type can be seen in low frequencies in some areas of mainland Greece (northern more than southern). However, Vardar Slavs commonly carry this type at frequencies much higher (35%) than that seen in Greeks (5 - 25%), Albanians (10%), Italians (0 -10%), and other western Europeans [33,61]. In this regard, the Vardar Slavs are similar to other Slavic people like Croatians, Slovenes, Czechs, Slovaks, Ukrainians, and Poles) [33,61]. According to Wiik, the Vardar Slavs, Slovenes, and Croats originate mostly from the "R1a Ukrainian area" compared to other Balkan peoples . According to Underhill et al. , the Japanese (as well as other populations) do show some similar Y chromosomal mutations to African Y chromosomal genes, thereby supporting an African origin of all humans. However, in stark contrast to Arnaiz-Villena et al. [4,5], they cluster with other South East Asian populations when looking at the non-African signature mutations that their Y chromosomes carry. Greeks group with other southern (Italian), and southeastern (Balkan) European peoples in a Mediterranean Europe cluster [42,43,44]. African mtDNA haplogroups can be seen in most European populations. Once analyzed, northwestern and central Europe falls on one end of the spectrum (less African contribution) while the Middle and Near East falls towards the opposite end (more African contribution). Greece (along with other south/southeastern Europeans falls somewhere in the middle [42,43]. In a very comprehensive study, 125 Greeks from Macedonia (60 from Thessaloniki, and 65 pastoral Sarakatsanoi from other Macedonian Greek cities and provinces) contributed their mitochondrial DNA along with nearly 3,000 other European, Middle Eastern, and North African peoples . This study clearly clusters the Greeks along with other Balkan peoples (Albanians) in an Eastern Mediterranean group. Haplogroup H was the most common European haplogroup seen. 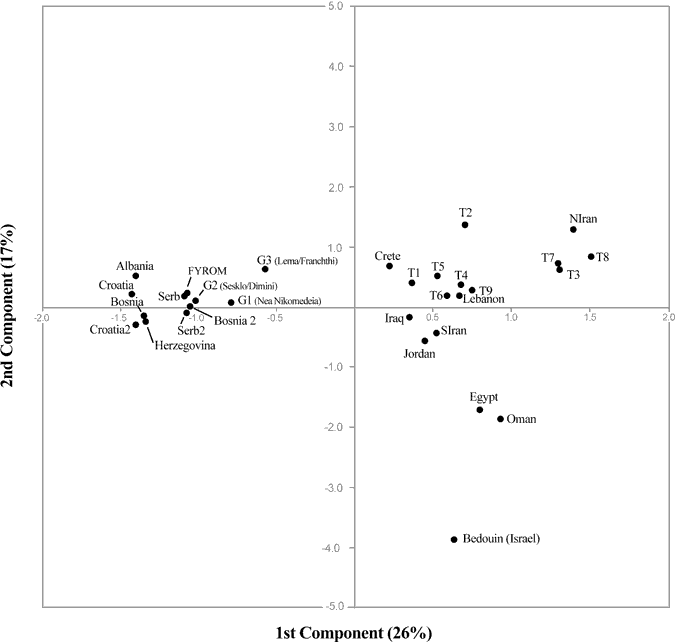 Interestingly, no Sub-Saharan African L haplogroups were seen among Greeks in this study. Achilli et al. studied the frequency of mtDNA from various populations from Europe (the Balkans, Mediterranean, Central and Northern Europe), the Caucasus, and the Middle East. The study included Greeks from the mainland, Crete, Rhodes, and Lemnos. Based on the mtDNA, the Greeks clustered very closely with southern Italians, and were close to the other Balkan population studied: the Bulgarians . The H haplogroup was seen in highest frequency, whereas the Sub-Saharan L haplogroup was seen in 0.4% of the studied Greeks (average European L frequency has been determined to be generally < 1%) [41,44]. Ancient Macedonian History, documented by Classical Scholars. Copyright (c) 2010 greek-dna-Sub-Saharan-myth.org. All rights reserved. Design by CSS Templates.